The United States Occupational Safety & Health Administration has modified the Hazard Communication Standard (HCS) to conform with the United Nations’ Globally Harmonized System of Classification and Labeling of Chemicals. The three major areas of change are in hazard classification, labels, and safety data sheets. 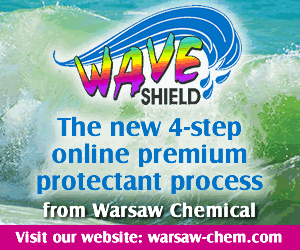 Visit http://carwash.org/for-operators/operate/chemical-handling-resources to view the full article online. During the inaugural Car Wash Show Europe in Amsterdam, the companies ACE – Holz – Peco will together, have a prominent location in the centre of the exhibition hall, covering an area of 540 meters squared (5800 sq.ft). This is by far the largest stand at the show. Visit http://www.carwash.org/carwashshow-europe/news/2015/09/15/the-largest-stand-at-car-wash-show-europe-ace-holz-peco to view the full article online. In spite of rain, sleet and snow, employees of Splash Car Wash have named the 34-year-old company as the third top place to work in the mid-size brand category of the annual Hearst CT Top Workplaces survey. Visit http://www.ctpost.com/business/article/Splash-Car-Wash-hires-for-smiles-6493422.php to view the full article online. Owner Shayne Hatfield has installed a solar heat exchange system on the south side of the building’s roof. When the sun’s rays hit glass vacuum tubes, it superheats water inside copper conducting tubes. The water is pumped into a water tank with a coiled heating element. The hot water is not only used to wash cars but to heat the floors in the winter time to keep ice at bay. Visit http://www.flatheadnewsgroup.com/hungryhorsenews/glacier-clean-car-wash-looks-to-the-sun-for-hot/article_7fdbf536-5708-11e5-a104-b76be5496f57.html to view the full article online. A growing number of companies are rethinking the way employee performance is measured. Some companies such as Adobe and Microsoft have done away with numerical rankings, while others, like Accenture, have eliminated annual performance reviews altogether. Visit http://www.bizjournals.com/bizjournals/how-to/human-resources/2015/09/elements-for-measuring-employee-performance.html?page=all to view the full article online. A radical experiment at Zappos may herald the emergence of a new, more democratic kind of organization. However fraught it may be, Zappos’s experiment with holacracy is just the latest sign that information technology is allowing the emergence of a new form of organization. Visit http://www.theatlantic.com/magazine/archive/2015/10/are-bosses-necessary/403216/ to view the full article online. The diminishing effectiveness of conventional advertising and the rise of social media have led more and more brands to embrace content marketing. Yet even as companies have embraced their new role as content creators, they’ve largely missed out on one of the hottest trends in the world of traditional media: data journalism. Visit https://hbr.org/2015/09/data-is-the-next-big-thing-in-content-marketing to view the full article online. Whether you’re sending emails to let people know about your latest specials, posting on social media about upcoming events, or just interacting with a client face-to-face at your store or office — you are marketing your business. Here are five important marketing lessons small business owners know better than anyone. Visit http://www.forbes.com/sites/constantcontact/2015/09/15/5-things-small-business-owners-already-know-about-being-a-marketer/ to view the full article online.